His new role as a sitcom dad brings him full circle from "Family Ties," even if it's been a circuitous trip. It's been 13 years since Michael J. Fox left "Spin City," not long after revealing his diagnosis of Parkinson's disease to fans. But as he returns Thursday in "The Michael J. Fox Show," playing a sitcom dad nearly 31 years to the day after the debut of "Family Ties," he's in the right place for the latest act in his TV career. Coming full circle has proven a circuitous trip for Fox, whose new show offers a welcome homecoming and a sign of the ties that bind us to the resilient actor. “The Michael J. Fox Show," part of NBC's Thursday night lineup just as "Family Ties" was in the mid-1980s, arrives during a season that will test the, well, back-to-the-future approach to programming. Robin Williams, who riffed his way to stardom 35 years ago in “Mork & Mindy,” also returns Thursday as a sitcom dad, pairing with adult daughter in CBS’ “The Crazy Ones.” Next week, NBC reboots "Ironside," which broke new ground in 1967 by presenting a lead character who used his smarts to overcome physical limitations. It will take more than nostalgia, of course, to reap success for "The Michael J. Fox Show," in which the 52-year-old actor plays a retired TV newsman who goes back to work, much to the relief of his family. Talk Stoop's Cat Greenleaf chats with Michael J. Fox about his new role as a beloved New York news anchor. Watch the premiere of "The Michael J. Fox Show," Sept. 26 at 9/8c. Fox paved the way for his full-time television comeback in recent years with guest roles that acknowledged his Parkinson’s without letting it define him – or turn him into a figure of pity. He managed to out-obnoxious Larry David on "Curb Your Enthusiasm" (“Pissed or Parkinson's?” David wondered aloud after getting sprayed by Fox with a shaken-up can of soda). Lawyer Louis Canning, the recurring character Fox portrays on "The Good Wife," used his condition – and cleverness – to his courtroom advantage. 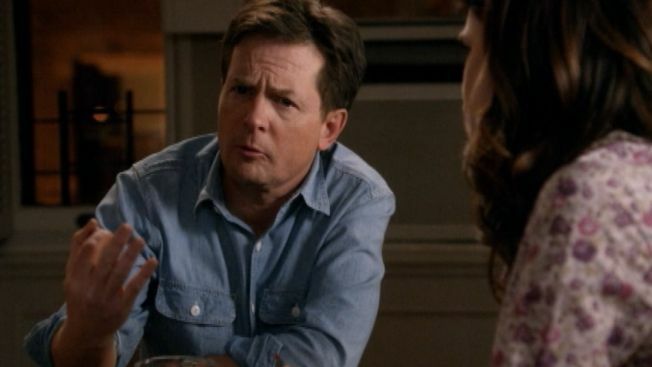 He was nominated for Emmys for both parts – three times for his “Good Wife” turns. Fox didn’t win on Sunday, but he gave a stirring eulogy for his mentor Gary David Goldberg, producer of “Family Ties” and “Spin City,” providing another reminder of why he belongs back on television.